Revised bestseller offers fast, effective approaches to head, neck and rib pain. OKLAHOMA CITY — The Freedom From Pain Institute has announced the release of the third edition of Erik Dalton’s classic Advanced Myoskeletal Techniques. Revised and graphically enhanced, the new 408-page hardcover has been streamlined for “in-the-trench” seasoned professionals who treat complex head, neck and thorax issues. Each section of the book addresses muscle imbalances and spinal biomechanics, along with soft-tissue treatments for common spine, rib cage and neurological issues. The text teaches simple assessment strategies to help therapists quickly identify and correct movement restrictions that may perpetuate pain and protective muscle spasm. The book is set up so busy therapists can quickly refer to specific techniques between clients. With enhanced reader design and richer graphics, visual learners will appreciate the hundreds of anatomical illustrations and technique demonstrations that accompany the text. This edition also includes contributions from respected manual therapists such as Michael Koplen, Whitney Lowe, Til Luchau, Aaron Mattes, Thomas Myers, Ross Pope and James Waslaski. Early reviews commend the new book as an essential addition to every manual therapist’s library. 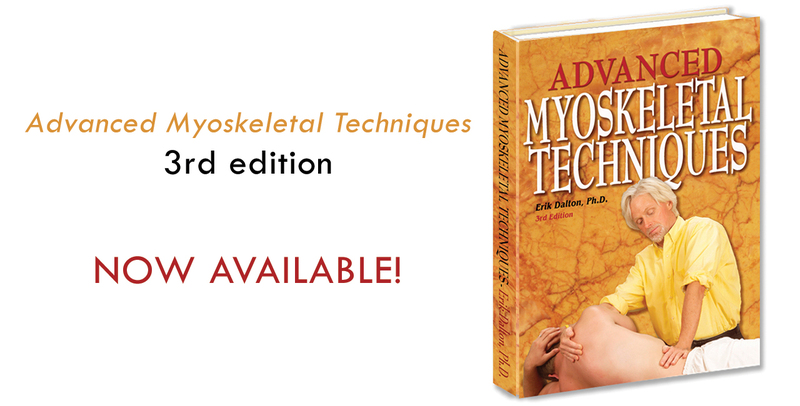 The Advanced Myoskeletal Techniques book is now available as a part of the best selling 22CE Upper Body Home-Study Course. For more information, visit www.erikdalton.com, or contact the Freedom From Pain Institute at (800) 709-5054.